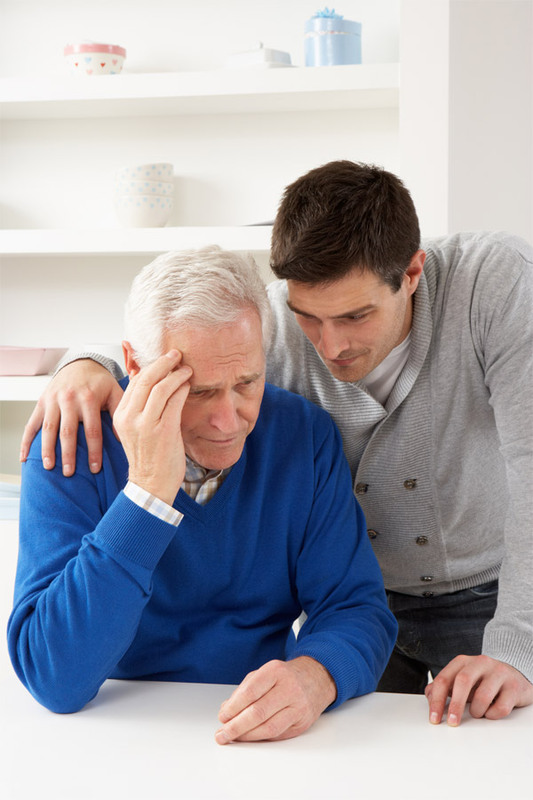 Now that your family member or friend has received a diagnosis of Alzheimer's disease, it's important to learn as much as you can about the disease and how to care for someone who has it. You may also want to know the right way to share the news with family and friends. Sometimes, you may feel that you don't know how to care for the person with Alzheimer's. This is a common feeling among caregivers of people with Alzheimer's because each day may bring different challenges. Learning about the disease can help you understand and cope with these challenges. Here is some information about Alzheimer's and ways you can learn more about it. Alzheimer's disease consists of three main stages: mild (sometimes called early-stage), moderate, and severe (sometimes called late-stage). Understanding these stages can help you care for your loved one and plan ahead. In the mild stage of Alzheimer's, people often have some memory loss and small changes in personality. They may have trouble remembering recent events or the names of familiar people or things. They may no longer be able to solve simple math problems or balance a checkbook. People with mild Alzheimer's also slowly lose the ability to plan and organize. For example, they may have trouble making a grocery list and finding items in the store. In the moderate stage of Alzheimer's, memory loss and confusion become more obvious. People have more trouble organizing, planning, and following instructions. They may need help getting dressed and may start having problems with bladder or bowel control. People with moderate Alzheimer's may have trouble recognizing family members and friends. They may not know where they are or what day or year it is. They also may begin to wander, so they should not be left alone. Personality changes can become more serious. For example, people may make threats or accuse others of stealing. In the severe stage of Alzheimer's, people usually need help with all of their daily needs. They may not be able to walk or sit up without help. They may not be able to talk and often cannot recognize family members. They may have trouble swallowing and refuse to eat. So far, there is no cure for Alzheimer's, but there are treatments that can prevent some symptoms from getting worse for a limited time. Here are some ways you can learn more about Alzheimer's disease. Visit the website of the National Institute on Aging's Alzheimer's Disease Education and Referral (ADEAR) Center. The Institute has a guide, Caring for a Person with Alzheimer's Disease, which can be viewed online and ordered in print. Find a support group for caregivers, ideally one in which members are taking care of someone who is in the same stage of Alzheimer's as the person you are caring for. You can help family and friends understand how to interact with the person who has Alzheimer's. Help them realize what the person can still do and how much he or she can still understand. Give them suggestions about how to start talking with the person. For example, "Hello George, I'm John. We used to work together." Help them avoid correcting the person with Alzheimer's if he or she makes a mistake or forgets something. Help them plan fun activities with the person, such as going to family reunions or visiting old friends. If the person with Alzheimer's has young children or grandchildren, you can help them understand what is happening. Answer their questions simply and honestly. For example, you might tell a young child, "Grandma has an illness that makes it hard for her to remember things." Know that their feelings of sadness and anger are normal. Comfort them. Tell them they didn't cause the disease. If the child lives with someone who has Alzheimer's, don't expect him or her to "babysit" the person. Make sure the child has time for his or her own interests and needs, such as playing with friends and going to school activities. Spend time with the child, so he or she doesn't feel that all your attention is on the person with Alzheimer's. Many younger children will look to you to see how to act around the person with Alzheimer's disease. Show children they can still talk with the person and help them enjoy things. Doing fun things together, like arts and crafts or looking through photo albums, can help both the child and the person with Alzheimer's. A teenager might find it hard to accept how the person with Alzheimer's has changed. He or she may find the changes upsetting or embarrassing and not want to be around the person. Talk with teenagers about their concerns and feelings. Don't force them to spend time with the person who has Alzheimer's.